Every two years televisions across the world tune into the Olympic Games. The event is a three week celebration of culture, diversity, and the sheer force of the human body. Winter Olympics in particular introduce new, strange sports as frightening as they are physically impressive. Viewers revel in the stories of unexpected athletes fighting against all odds, like the women who make up Nigeria’s first bobsled team this year, and in the inspiring stories of bravery and acceptance, as exhibited by Adam Grippon and Gus Kenworthy, the first openly gay men to qualify for the Winter Olympics. While global politics are always present at the Games, the events also remind us all countries are made up of people just like us. This year the stage is PyeongChang, South Korea, and Team USA includes some truly extraordinary athletes, including, but not limited to, the inspiring women listed below. This is the Broadview’s list of Women to Watch in the 2018 Winter Olympics. At the 2014 Olympics in Sochi, Mikaela Shiffrin became the youngest Athlete in history to win a gold medal in slalom, at just 18 years old. During those same Olympics, Shiffrin caused a stir when she claimed that she could win five gold medals in PyeongChang. This comment was considered audacious, but she saw superstars Michael Phelps and Usain Bolt dominate their sports and sweep their events, so why couldn’t Shiffrin do the same for skiing? As of last night, Shiffrin is one gold down, four to go. The Vail native can often be seen racing in her trademark Captain Marvel inspired uniform (possible foreshadowing?). We already love her for her Super Bowl commercial for the Olympics where she shares the story behind her motto “A.B.F.T.T.B.” — Always Be Faster Than The Boys. Originally a track and field athlete, Aja Evans decided to take her Olympic dreams to the ice after an unsuccessful attempt at the 2008 summer Olympic team. The speed and strength she honed on the field proved to be equally useful as a brakeman pushing a sled on the bobsled track. In PyeongChang, Aja will be paired with pilot Jamie Gruebel Poser. The U.S. is the only country to win at least one medal in every women’s bobsled race since the sport was introduced, a record we can expect to continue this winter. PyeongChang is the first Olympics for snowboarder Chloe Kim, who is just 17 years old. She was unable to compete in 2014 not because she wasn’t good enough, but because age restrictions did not allow it. But that did not stop Kim from competing and building up quite the resume. She is now the only athlete in X Games history to have won three gold medals before the age of 16 and has positioned herself as the one to beat. These games are especially important to Kim, a first generation Korean-American whose Korean family will be in the stands cheering her on for the first time. Kim’s already won a gold medal in the women’s halfpipe final. Kim after the women's snowboard halfpipe finals on Jan. 13, 2018 in Snowmass, Colo. PC: Team USA. As a five year old girl, Mirai Nagasu was being primed for a career as a professional golfer. Then one day a rain storm stopped her from practicing so her parents took her to the skating rink instead. As you may have guessed, the rest is history. Less than ten years later, Nagasu won the U.S. national title at just 14 years old. She made her Olympic debut in 2010 but was then cut from the 2014 team despite placing third in the national championships. Earlier this season, Nagasu became the first American female figure skater to land a triple axel jump in an international competition since Tonya Harding did so in 1991. This year marks the 20-year anniversary of the USA Women’s Hockey Team’s storied Gold Medal in Nagano, the first Olympics in which women’s teams were invited to compete in the sport. The team has medaled in every Olympics since. Standout players Hilary Knight, Meghan Duggan, and Monique Lamoureux-Morando are expected to help the team continue that streak this winter in PyeongChang. 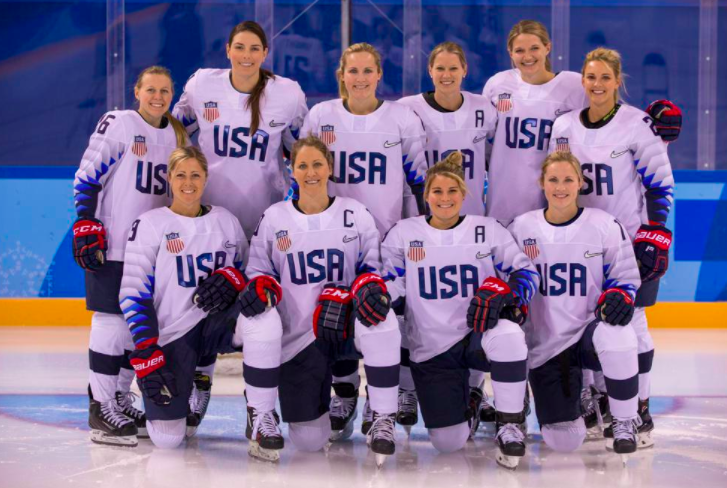 The 2018 U.S. Women's Hockey Team. PC: Women's Olympic Teams. The PyeongChang WInter Olympics run from February 9th to February 25th. Don’t miss these amazing broads as they go for the gold!